SGM has made an important breakthrough with its revolutionary LED products in Finland, notably with Jaakko Peltomäki Ltd. After the Helsinki-based events company saw the Danish company’s impressive display at Prolight+Sound 2012 Jaakko Peltomäki himself made the decision to invest, after being particularly impressed by the LB-100 LED Balls. “We were looking for some new ideas for our productions — and these were perfect,” he said. Seeing how they could be formed into curtains to deliver alluring 3D spatial effects, they invested in 550 strings, each containing seven 34mm Balls, 20 TLD-612 pixel drivers to run it … and some extension cords. The 21-year-old company has a versatile work roster, ranging from fashion shows to retail, and they have full turnkey capability, with sound equipment, trussing, video and LED screens. “In fact I was looking for the LED screens when I happened to see the LED Balls — so it was kind of impulse shopping,” said Jaakko. 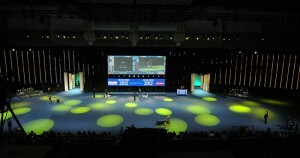 Helping these products to animate the sets has been the company’s lighting designer, Teemu Pietiläinen. He was soon creating a ‘moving’ 9m x 6m LED canvas for a Helsinki fashion house, with the 12cm pixel pitch display. “This was the largest canvas to date, which was made purely for demo purposes,” he said. 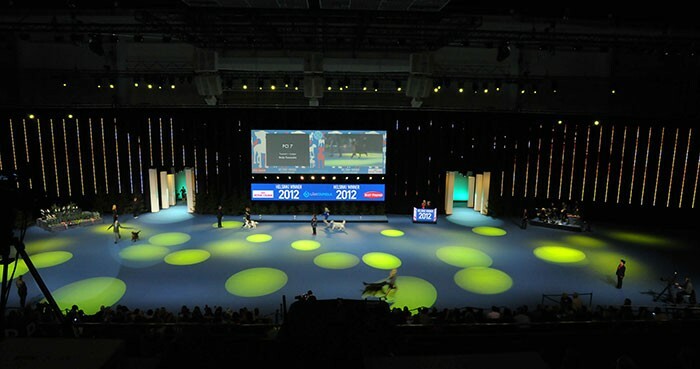 “We also used the LB-100’s at Helsinki Winner International Dog Show in December; that canvas was about 100m wide — but the gap between each string was approximately 1.2 metres.” All were controlled off SGM’s TLD-612 Touring Pixel Driver via Artnet DMX converters with the content mainly driven from a Green Hippo media server. An LB-100 display is made up from 0,85m long strings, each supporting seven white LED balls. These in turn contain two powerful RGB LED’s (rated at 42mW per pixel) built into the white plastic moulding and enabling the semi-transparent IP65-rated LED Balls to be viewed in 360°. The strings can extend to a maximum length of 6,8 meters (using 56 balls) while the total power consumption is just 42W. The event’s company’s clients are systematically realising the potential — whether major blue chip corporations like Finnair or Finnish rock bands such as Apulanta who used these festoons during their last autumn tour. Jaakko Peltomäki Ltd receives full support and back-up from Timo Kunnas at local SGM distributor Noretron, who fulfilled the order.